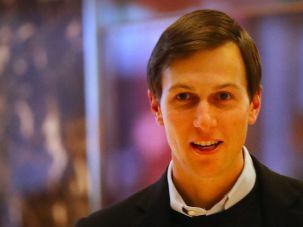 Is Jared Kushner on the Verge of Becoming Donald Trump’s ‘De Facto President’? Another Kushner charity beneficiary located beyond Israel’s internationally recognized border is the Etzion Foundation, whose U.S. fund-raising offices are located in Teaneck, New Jersey. The foundation supports Yeshivat Har Etzion, Kibbutz Migdal Oz and the Herzog College teachers’ training institution – all located in the Gush Etzion settlement bloc outside Jerusalem. In 2012, the Kushner family foundation donated $5,000 to the Etzion Foundation, and in 2013, another $10,000. Another settlement enterprise that recently received money from the Kushner family, albeit a small amount of $500, was the radical Od Yosef Chai yeshiva in Yitzhar. This particular yeshiva has served as a base for launching violent attacks against nearby Palestinians villages and Israeli security forces, as well; as a result, it no longer receives funding from the Israeli government. In recent years, the Kushners’ pet project in Israel has been the Shaare Zedek Medical Center. In 2014, the family pledged $18 million to the Jerusalem hospital, in addition to $2 million it had already committed. The Kushners have a history of supporting hospitals – both in Israel and the United States – but this was by far the largest gift given by the family to a single medical institution. In the United States, the family foundation supports many Jewish day schools, charities and cultural centers. In recent years, it has contributed close to $30,000 to various institutions operated by Chabad – the ultra-Orthodox outreach organization. One of the single largest beneficiaries of Kushner contributions in recent years has been The Ramaz School in Manhattan. During each of the last four years for which tax information is available, the elite yeshiva day school received $250,000 from the family foundation. Haskel Lookstein, the former principal of Ramaz and a prominent modern Orthodox rabbi, supervised the conversion of Donald Trump’s daughter Ivanka before she married Jared Kushner.